There were no problems at all. In fact, I found that there was a certain ease as each day progressed. No symptoms of fatigue crept in, and while conducting six concerti is mentally taxing, the physical part was about as comfortable as I have felt in years. That is not to say that the works I led were easy; there is always a certain restraint that must be employed in order to fully comprehend what each soloist has in mind. As seems to be usual at these competitions, it is the members of the jury, representing diverse backgrounds and opinions, who make the event most interesting for me. The rigorous schedule demands a group that interacts well with each other and maintains a sense of humor throughout. The voting is more or less an anonymous process, with no discussion of the merit of the candidates until the competition has concluded. All six of the finalists displayed strong attributes, reinforcing the belief that the classical music world will be in good hands for the future. Since I only interacted with these young violinists for the finals, I could not contextualize how they fared in the earlier rounds. The end result was based on the cumulative scores and did not necessarily reflect my own thoughts about the finishing order. And I had the benefit of rehearsals with each contestant, watching who sustained the grueling schedule and who might have been a bit tired toward the end. Some of you will remember that I wrote extensively about my participation in the Van Cliburn and Besançon competitions. These were the only two that I really participated in, as I never had gone through this process in my early conducting years. Aside from auditioning members for the orchestras that I have led, the race to the finish line has not been among my favorite ways to learn about young talent. A few new thoughts have crept into my head since the conclusion of the Indianapolis marathon, most of them generated through information gleaned from various musicians who have participated as contestants and jurors. Each competition stipulates different ways to screen the applicants. These days, many are done via video, helping to keep costs down for everyone. But there are built-in perils with this method. I learned that there are strict rules regarding editing that go into making these videos. The sound has to be good, and the camera angles need to be consistent so there is no chance for retakes of a piece of music on the part of the applicant. However, a cottage industry has sprung up because of these rules. There are now professional video companies that specialize in making the recordings for submission to the competition. Several instrumentalists have utilized them, and these are done more like recording sessions, with continuity so smooth that it is impossible to tell that any editing has been done. I was also told that some even lip sync, mimicking someone else’s recording, only to be found out when they show up at the actual competition. Then there is the matter of how many of these tournaments there are in the world. It is not unusual to find a musician who did not win at one event moving directly to another one the next week. Many have sponsors and can almost make a career by just competing. According to the Alink-Argerich Foundation, there are close to 1,000 competitions in music throughout the world. When I chaired the Cliburn, there was a pamphlet going around that listed something like 180 of these just for the keyboard. With the ability to get one’s message out via all the music and social media platforms, I wonder if it is really so important to have this many competitions these days. Certainly, a first prize can lead to a career, but it can also have a negative effect if the performers cannot sustain the high level of musicianship that got them the prize in the first place. And what about all those who do not make the cut? We cannot know why some do not fare well at these events but appear to be solid musicians. Perhaps there are many who are just not cut out for the competition world. Jaime Laredo, head of the Indianapolis jury for many years, puts it into perspective when he says that the two-week cavalcade is good for the cities where the competition takes place. It also provides an accurate overview of the state of violin playing today, for better or worse. He and his fellow jurors did a great job in putting their own artistic views in check by trying to determine who did the best for these rounds. It was not their place to figure out who would be around ten or fifteen years from now. As in most sports, someone has to win, no matter the level of overall play. But the top violinists for this competition all had qualities that made them worthy of the award. And certainly worthy of accolades were the outstanding musicians of the Indianapolis Symphony Orchestra. In some ways, spending a week with soloists front and center is a thankless task. No Brahms symphony, Strauss tone poem or Rossini overture to play. But this ensemble, which I had not conducted since the mid ’80s, was responsive and attentive to each competitor. It was a pleasure to work with them, and I hope not to wait much more than a quarter century to see them again. Also impressive was the downtown area of the city. Bustling with activity all day and night, this is not a place for vegans, as every other dining establishment is a beef lover’s dream. The atmosphere is infectious and friendly, with everyone being helpful. The only blight on this is the surprisingly high number of homeless people one sees on every street. But my overall impression of the Hoosier capital was highly favorable. From the heart of the Midwest, I was off to the heart of Russia. This was the first time I had been to the country when it was not snowing. How lovely Moscow can be in the middle of September. And Red Square at night is truly breathtaking, with all the years of history glaring at you from the Kremlin. 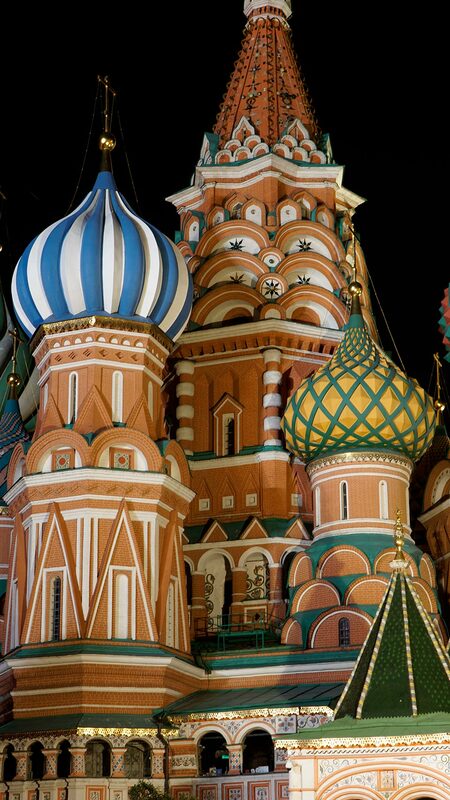 Ivan may have been terrible, but at least he produced one of the most magnificent structures to be seen in the world today, St. Basil’s Cathedral, which is so much more impressive in person than in all the photographs I have seen. 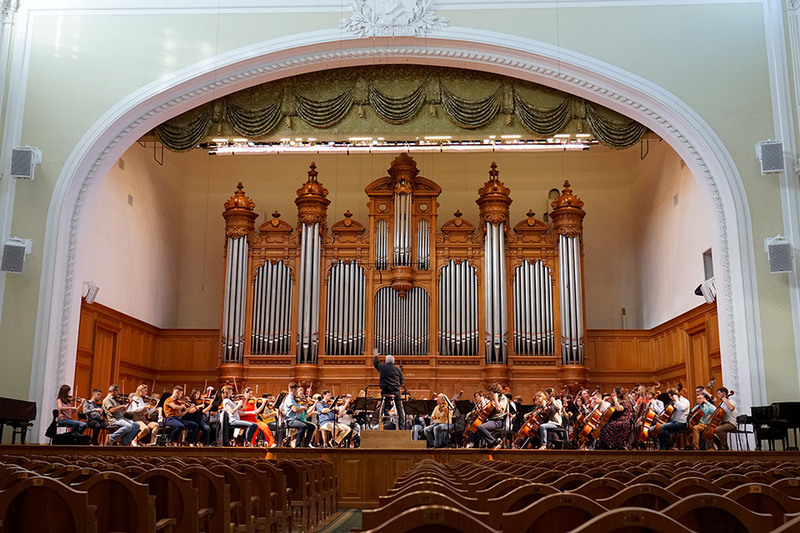 In addition to the climate, another first was the opportunity to work with the Moscow Philharmonic. This was the orchestra of Kondrashin and the one that played when Van Cliburn won the Tchaikovsky Competition back in 1958. Imagine what it felt like for me to perform a concert in the Great Hall of the Conservatory, knowing of all the incredible artists who had come before. 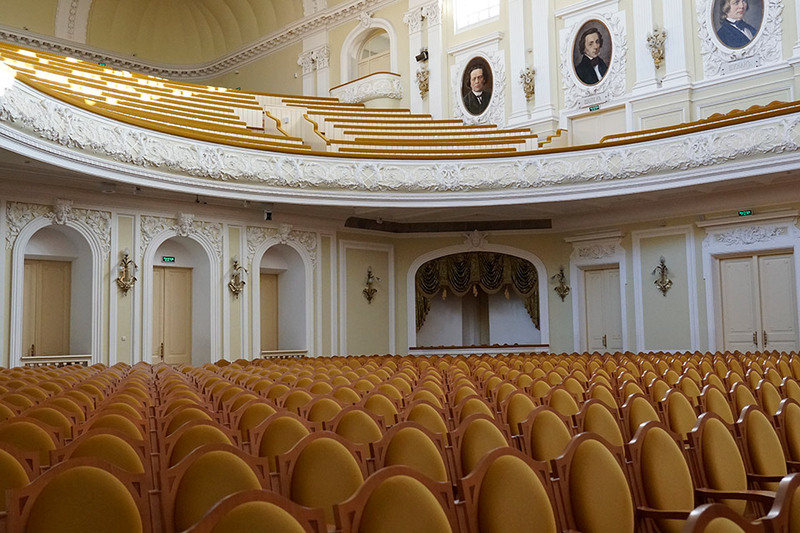 The rehearsals took place in Tchaikovsky Hall, which is not the same as the one in the music school. 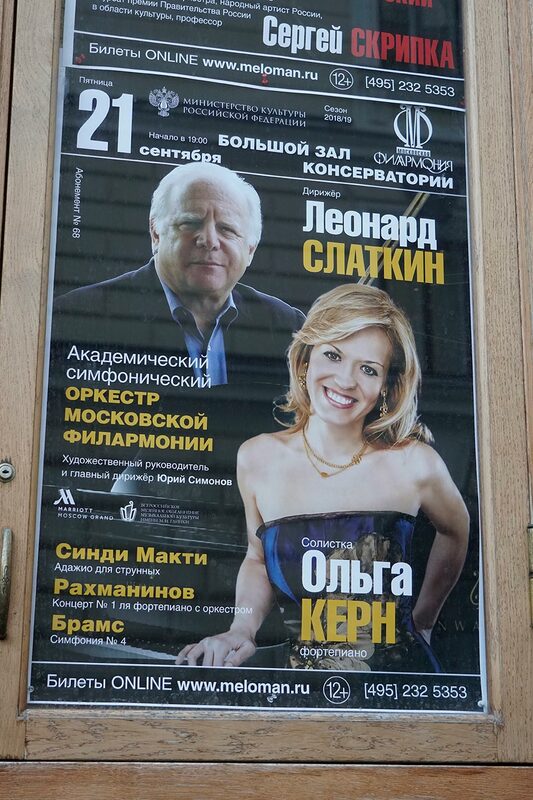 I last performed there with Denis Matsuev a few years ago, and the acoustics were somewhat dubious. Since that time, the venue has undergone a makeover and is now excellent, with a warm and spacious sound. Those words came to mind when I gave the upbeat for the Fourth Brahms Symphony and heard the glorious string sonority that the Russians can provide. As the rehearsals progressed, it was clear that the orchestra and I had a very strong connection. They worked undauntingly on every detail of phrasing and balance. It was a luxury to have nine double basses and twelve cellos, for a total of more than sixty string players. But the dynamic spectrum was always appropriate for the moment of the music occurring at the time. The same sonic profile would continue during the dress rehearsal and the concert. 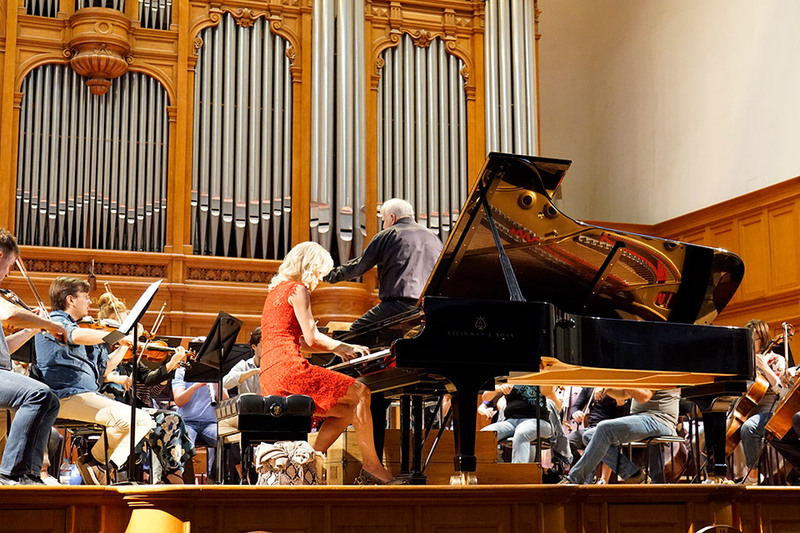 The week was made even more memorable because my soloist was Olga Kern, playing Rachmaninov’s First Concerto in her hometown. I could only imagine how this felt for her, with family and friends in attendance. We had a lovely dinner with her brother, her sister-in-law, and her son. Sadly, we did not get to see Olga’s mom and dad but with any luck, that will happen on a return visit. In the meantime, with the audience demanding two encores from her, Olga was in her element. I was truly happy for her. The concert opened with Cindy’s Adagio for strings, taken from her symphony. Similar to that in its counterpart by Barber, there is a melancholy tune that permeates the entire work, and this in turn is borrowed from a portion of Penderecki’s Polish Requiem. With that amazing string section, there was never a question that this would be an extraordinary experience. I think that Cindy was even brought to tears, and the orchestra greeted her onstage appearance with much applause and tapping of bows on the music stands. The Brahms was sheer joy. I was hearing part of my own heritage while leading it. This was not a question of stereotype. Many think Russians are only capable of playing the music of their homeland, just as the same is sometimes said of Americans having little affinity for the repertoire of other nationalities. Maybe this was true at one time, but it no longer exists. The Moscow Phil brought their distinctive personality to the final symphonic utterance by the German master. Why change this individuality? What a pleasure to hear a really unique orchestra in this music. After the first rehearsal, I was asked if we could have something as an extra treat for the audience at the end of the concert. Knowing that the soloist would have played one or two encores, I wondered if it was needed or even appropriate after the emotional journey of the Brahms. But they insisted, and I decided that the Waltz from the Tchaikovsky Serenade for Strings would be a nice bit of homeland elegance for the listeners. All of us had a great time rehearsing it, and at the performance you could easily see the members of the orchestra enjoying this morsel with smiles and even laughter. How could this week be topped by anything? Well, I headed off to another place where I had not ventured before. 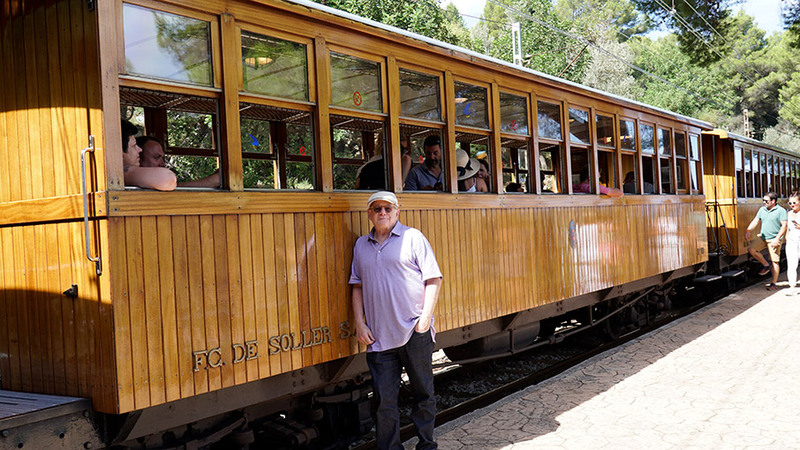 Spain has always been a favorite destination for me, except for the bullfighting part. When I received an invitation to conduct the Orquesta Sinfónica de Baleares, I first had to look at a map to find out where it was! 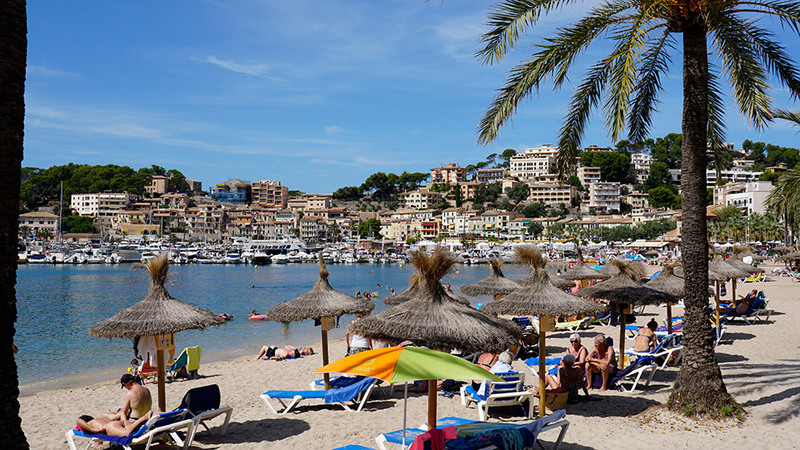 In the southeastern part of Spain there are a few islands, called the Balearics; the major one is Mallorca. 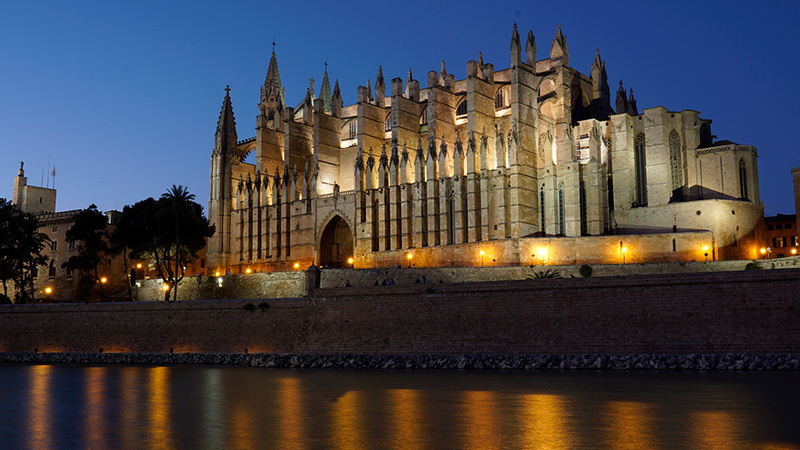 Its capital is Palma, and this whole region is the playground of visitors, many from Germany and England, who want to get to the warm climes and ocean breezes. The orchestra has been around for almost thirty years and has had some rough times. But today, they are getting their act together and boast a roster of musicians from twenty-four countries. Of course this makes them a bit more international in terms of sonic profile, but one could not ask for a more enthusiastic set of professionals, very disciplined and well prepared. We played the same Brahms symphony and Cindy’s Adagio that I had conducted the week before. Added to the mix was the Candide Overture and Haydn’s Symphony No. 70. All in all, a good variety to test the mettle of the ensemble. They were responsive from the start. Rehearsals took place in a former television studio. As with so many orchestras, they do not have a true home that is also the venue where they perform. But the acoustics were not bad, and the dry nature of the facility actually enabled us to hear each other well. This helped produce a better sense of ensemble and coordination between and among the sections. For a change, there was enough time to be a tourist and see the sights. 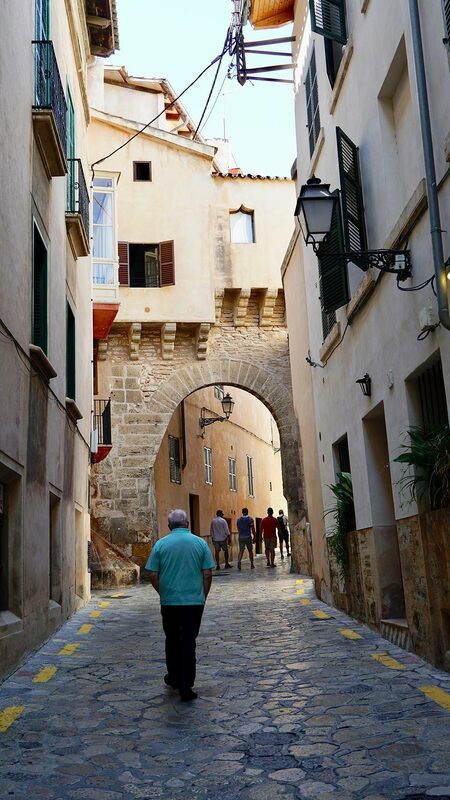 Whether exploring the magnificent cathedral, riding the train to the charming seaport of Soller, or just walking around in the old city, the Spanish flavors were in evidence throughout. The auditorium was built fifty years ago, and the inaugural concerts were given by no less than the Berlin Philharmonic with von Karajan. When I was driven to my first rehearsal, the general director of the orchestra said that my appearance was the most important one since that time. Frankly, I have my doubts, but one takes compliments wherever they can be had. The concert itself went very well, with the orchestra responsive throughout. I had told them at the dress rehearsal that we knew the program well and I hoped they would just enjoy themselves in the evening. It certainly appeared that way, with musicians smiling and getting into the varied spirits of the pieces. Sometimes it is more inspiring to work with orchestras that are a bit off the radar. I will be doing a few more dates such as this one as we progress over the next few years. It is fun, musically rewarding and refreshing work. Now it is back to the States. I could not help but be riveted to my laptop, cringing at the spectacle in Washington. But you know what? The rest of the world frankly does not care much about what is going on in the States. Being out of the country is a great reminder that there are other things going on in the world. And I wish I could have been diverted by the Cardinals’ push to get into the playoffs, but as of this writing, they seem to have gone into September swoon. Guess we will have to wait until next year. But you do not. I will see you next month.